The finish of Weber Q320 portable propane grill is not only aesthetically pleasing, but offers rust resistance. People were generally happy with the small footprint of this unit, and found the included work tables to be highly useful as additional food preparation areas. Most buyers reported that assembly was easy, and that the parts used in this grill’s construction were of a good quality. Overall, it was reported that this a sturdy and robust unit. However, buyers did mention that the parts had sharp edges that were particularly evident during the set up and dismantling processes. There are a few complaints about premature rusting with this unit, but most people have said that there is no rust development even after being left outside for a whole year. Some people complained that the user manual was poorly written, and that moving the unit, on its two wheels, was a difficult task. This does seem to be a complaint among a very small percentage of people who bought this unit. 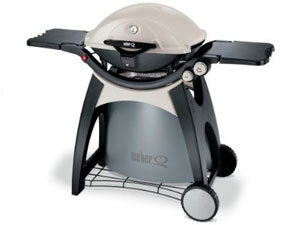 Reports about the overall cooking experience on the Weber Q320 are mixed. Some people report having a great experience, while other reported the opposite. The push button ignition system seems to be temperamental, and some buyers have reported rust issues with the porcelain enameled cast iron grill surface with some people saying that the grate was covered with orange rust flakes after only a year of ownership, making it unsafe to use. Other people maintained that the grill surfaces were a good benefit of this grill, meaning that their food came out with the sear marks they desired. However, many people said all types of meat stuck to the surface far too easily, though some customers stated that this was remedied by conditioning the grill-rack with oil before use. Reviews about cooking temperature consistency are also mixed. Some people stated that the cooking temperature is difficult to control, and that the built-in thermometer is inaccurate, while others have reported excellent heat distribution and cooking results. This unit comes complete with a recommended manufacturer’s maintenance schedule, which, if followed, will help increase the longevity of your grill. As with any new piece of equipment, reading the instruction manual thoroughly before use can help increase your overall experience.